Previous chapers: Part 1, Part 2, Part 3, Part 4, Part 5. It has taken a while to be able to add to this series, as adidas had so many styles at the 1990 World Cup, with many of them on the more advanced side in terms of design. The last instalment, before Christmas, looked at half of the company’s offerings at Italia 90, with the output more varied than at any time before or since. For instance, already we have looked at two shirts worn by Sergio Goycochea after took over as Argentina goalkeeper following injury to Nery Pumpido, but in the opening game against Cameroon, Pumpido wore something which was almost unique. It was grey shirt with an irregular pattern, not representative of anything in particular as far as we can see. In fact, the only other example we could find was a yellowy-orange version, worn by Goycochea for Racing Club. Like Argentina, Colombia also had three completely different designs on show. In the first game against the United Arab Emirates, Higuita wore a grey shirt with a herringbone pattern on the front (below left), and then for the Yugoslavia and West Germany matches he had the one seen above. Colombia met Cameroon in the second round and this time Higuita was in a different grey shirt (below right), with baggier sleeves and an arrow motif. The latter style, in blue, was also worn by West Germany’s Bodo Illgner against Colombia. However, when one thinks of Illgner at that World Cup, it is his other shirt which comes to mind, the design known as the Taifun. He would wear a silver, black and pinky-purple version, with Romania’s Silviu Lung donning a silver and blue edition against Argentina and the Republic of Ireland. At the time, we weren’t too keen on it, but now we can appreciate the the level of design involved. The shirt would appear in two other colourways, as we will see in the next part in the series. Lung was another of the three-shirt brigade. Against the USSR, he wore the same purple and green style that Pumpido and Goycochea wore for Argentina against the Soviets (see Part 5). Then, for the match against Cameroon, Lung wore another distinct design, this one featuring what can only be described as scribbles across the torso. Incidentally, none of the Romania shirts at the tournament, outfield or goalkeeper, featured a crest. It was a look which a few other countries also had. Jan Stejskal of Czechoslovakia and the USA’s Tony Meola had a yellow version with grey collar and cuffs and grey and black scribbles, while Yugoslavia’s Tomislav Ivković also wore yellow, but with black collar and cuffs and seemingly only grey scribbles, though red and black versions exist too. Incidentally, he only wore this in the knockout stages against Spain and Argentina, having had ‘badge-engineered’ Uhlsport shirts in the group stage. As mentioned above, Meola wore the same as Stejskal for all of the USA’s games, but substitute goalkeeper David Vanole was clearly allowed some leeway as he appeared in both blue and dark grey shirts on the bench. We’ll be back very soon with Part 7, as the designs in the 1990s began to become more and more brash, coupled with adidas’s own rebranding under the adidas Equipment heading. 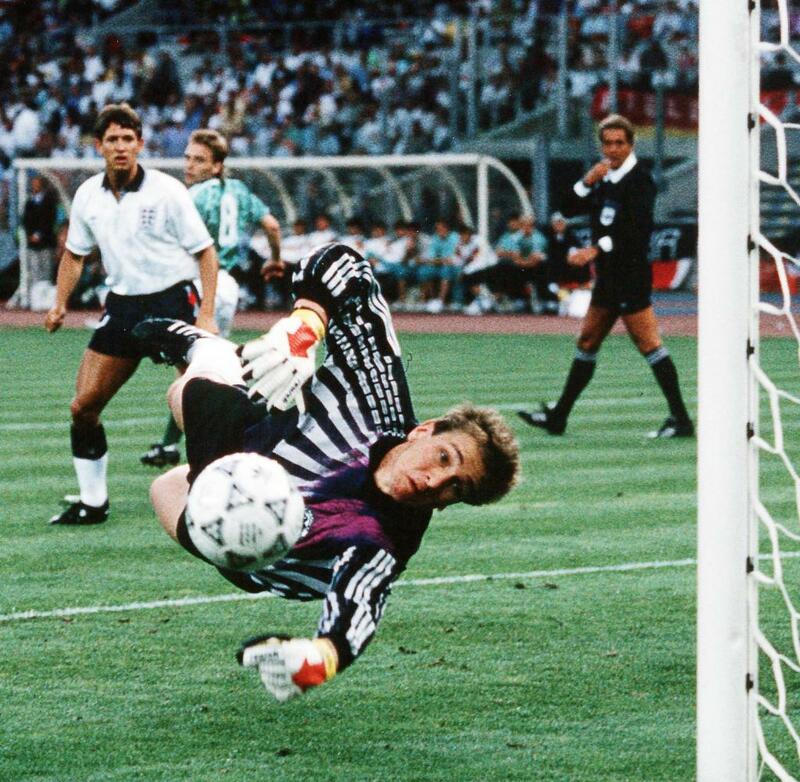 Interestingly, the black/grey/purple shirt worn by Bodo Illgner was slightly different in Italia 90 – it had grey adidas stripes on the sleeves instead of purple. 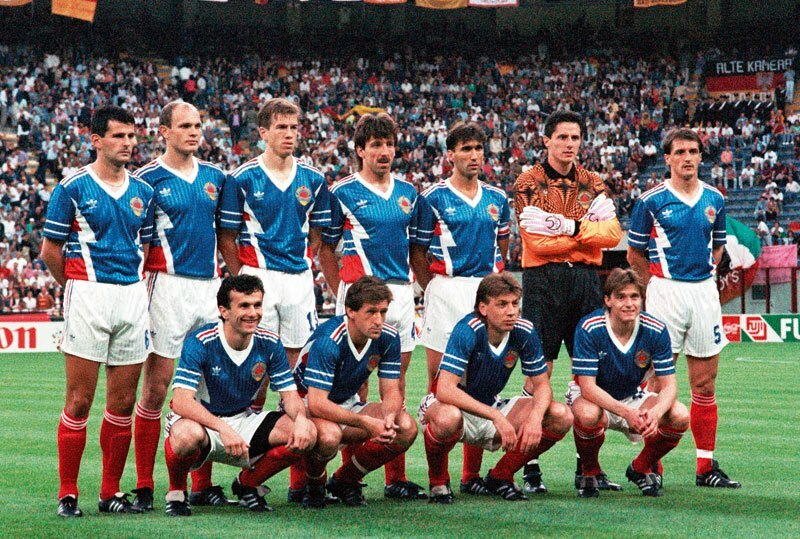 By the time of the Euro 92 qualifiers, Illgner wore the version as seen in the article with purple adidas stripes on the sleeves.